Perhaps under the floorboards or in the attic that you have not cleared out for 50 years. It would be great to have all copies and we hope to find the missing copies some day. the footpath by forcing the gate and crossing what is as yet private property. LIGHTING - Following repeated applications from this Association for adequate lighting in Baldwins Lane, the Council have decided to partially fulfil this need by erecting nine new columns in Baldwins Lane arid providing them with the sodium lamps at present on the Green. Those removed from' the Green are to be replaced by 150 watt Tungsten lamps. 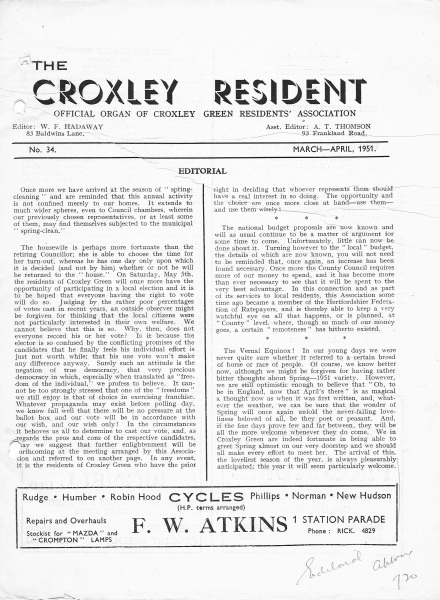 THE GREEN - Considerable perturbation was felt by the Croxley Green Society at the deplorable condition of The Green and at the: Society's meeting on March 21 it was resolved that an expression of the Society's concern be communicated to the Dean of Caius College, Cambridge. It was felt that the dispoilation was, in the main, attributable to (1) rubbish being left by casual visitors and gypsy camps; (2) horse-riding; (3) causing of ruts by cars wantonly using the Green instead of the roads provided. 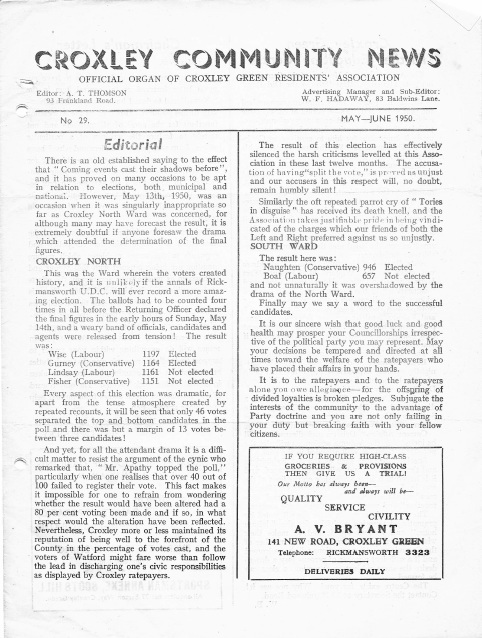 The question of the revival of May Day was also raised and the Committee were to make enquiries with this end in view. There was a margin of 13 votes between three candidates. Rev. 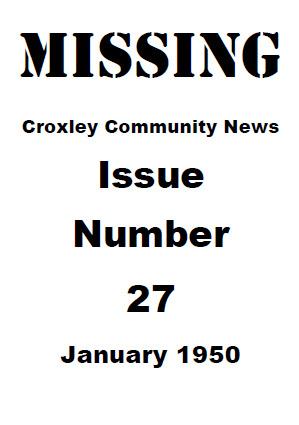 Raymond S. Wilkinson sadly tendered his resignation from the position as President of the Croxley Green Residents Association. Eric Norman was advertising a special!!! 200 dresses at 23/11 each with hip sizes of 38 to 50 inches and news was passed on as to the major change in local planning laws allowing 10% expansion of properties. The reputation and status of the Residents' Association is, we are proud to say, of the highest standing and it 'is no secret that the Council respects the integrity of purpose in any matter which the Association takes up on behalf of a member. 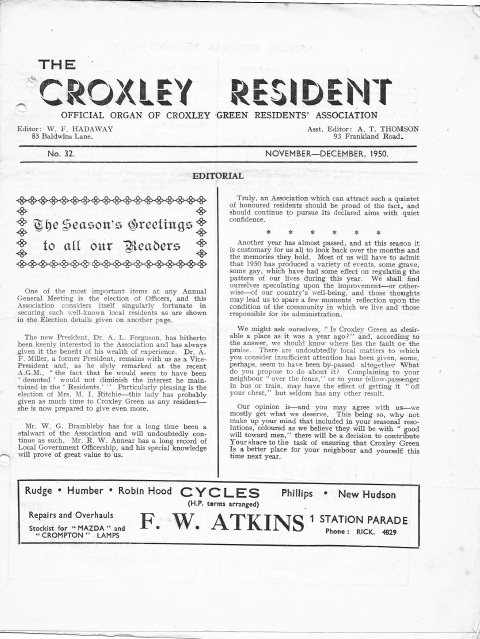 If you are not already a member then join the Association and strengthen the organisation whose sole allegiance and aim is to and on behalf of Croxley ratepayers. 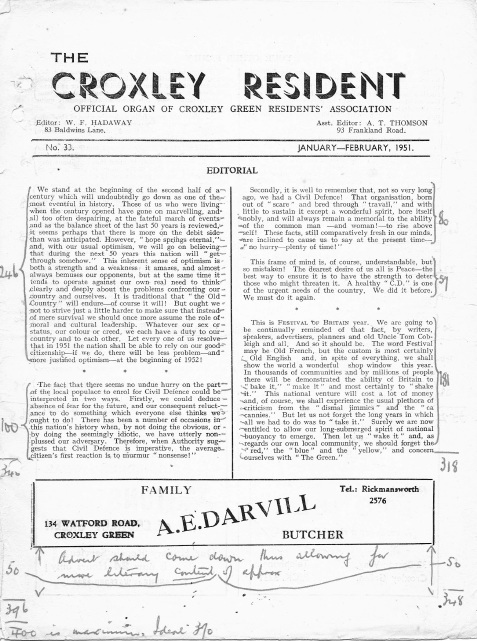 ​There is little doubt that the loss incurred by the Croxley and Rickmansworth Civic Restaurants for the year ended 31st March, 1950, came as an unpleasant shock to the ratepayers. As wiII be seen from the figures appearing on Page 5, the deficit of £1,444, which will have to be borne by the General Rate Fund, is one ratepayers cannot afford, and whatever action is to be taken will require to be drastic: £1 ,444 approximates 1.5d. in every £ of Rateable Value. LITTLE GREEN LANE SCHOOL SPORTS - The well organised inter-house sports, arranged by the staff of the Little Green Lane School, were held on the School ground on Tuesday, 27th July. There was much competition for the honours and many children were seen to push out their chests twice normal when they had secured a few points for their "House." "Red House" finally triumphed, but we hear that the other houses have vowed to put matters aright next year. It is gratifying to see so many parents at these functions-a detail which means so much to the children and the school staff. Lt.-Col. Goad presented the honours and said a few well-chosen words to the children. 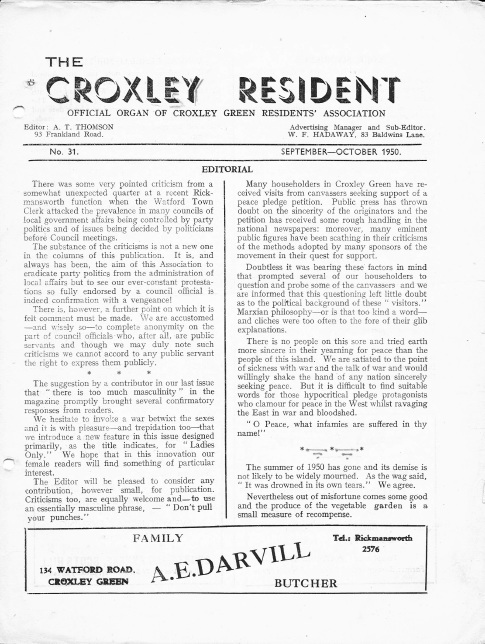 THE GREEN - We are pleased to note the Commoners have now agreed to send a delegate to the Committee Meetings of the Croxley Green Society, a resolution which we feel will not only lead to a full resumption and enjoyment of the Green's amenities, but will at the same time safeguard the interests of the Commoners. 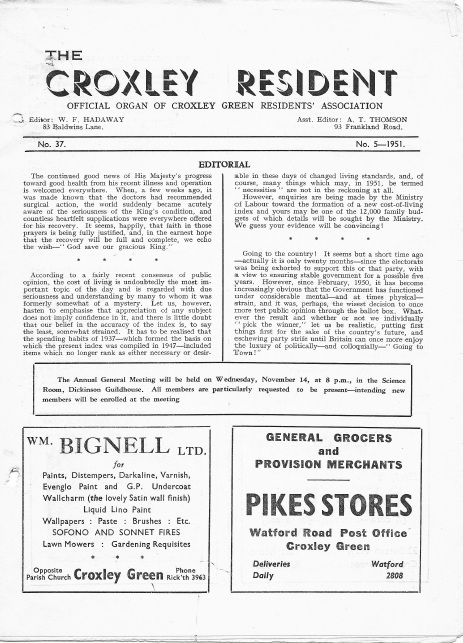 ​Dear Sir, The Committee of Croxley Green Horticultural and Allotment Holders: Society would like to thank you for your column in the last issue regarding their Annual Show. As a result we have had a number of new members from your Society and we are hoping for more applications. The service the Society is able to give depends largely on the strength of the Membership, We hope, therefore, that local residents will give us their support by joining our Society. Yours truly, KAY M. RAGGETT, Hon. Secretary. own home and garden look more attractive, but they contributed materially to the appearance of the district as a whole. October 26.-A lecture" Fruit Culture," by Mr. A. H. Lugg, N.D.H., Horticultural Supdt , Herts. Institute of Agriculture, to be held at the Science Room, The Guildhouse. November 23. - Also at the Science Room, a lecture, "Culture of Chrysanthemums," by Mr. Lambert-member of the teaching staff at" the Herts. Institute of Agriculture: Admission is free and all are welcome. mostly get what we deserve. 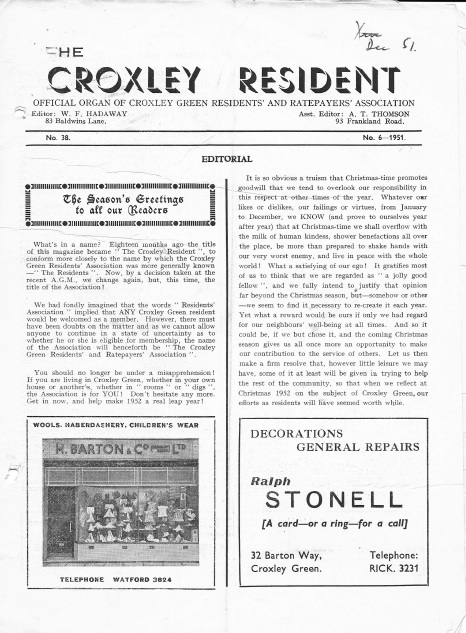 This being so, why 'not make up your mind that included in your seasonal resolutions, coloured as we believe they will be with" good will toward men," there will be a decision, to contribute Your share to the task of ensuring that Croxley Green Is a better place for your neighbour and yourself this time next year. consider the extent of the festivities, to discuss the ways and means of arranging any functions and to suggest suitable dates. 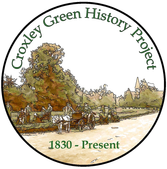 Although it is too early yet to give a complete picture of the possible extent of the venture, it can be said that this is provisionally timed to take place during the week commencing 18th June and end with a series of events on the Green on Saturday, June 23rd. During the week it is hoped, through- co-operation with the Youth Organisations and other societies having facilities for indoor shows, to complete an attractive programme which should be of interest to all. The festivities on the Saturday should incorporate such items as Children's Fancy Dress Parades, Maypole Dancing, displays of Country Dancing and many other similar events which can so well be included in a programme of this description. Whilst this small sub-committee can do much towards organising 'the programme, there is much to be done by that worthy band of volunteers which always comes forward on these occasions. ​Shops - The Minister has made known his decision in connection with the appeal against the siting of shops and the refusal to permit development of Pitkins land. 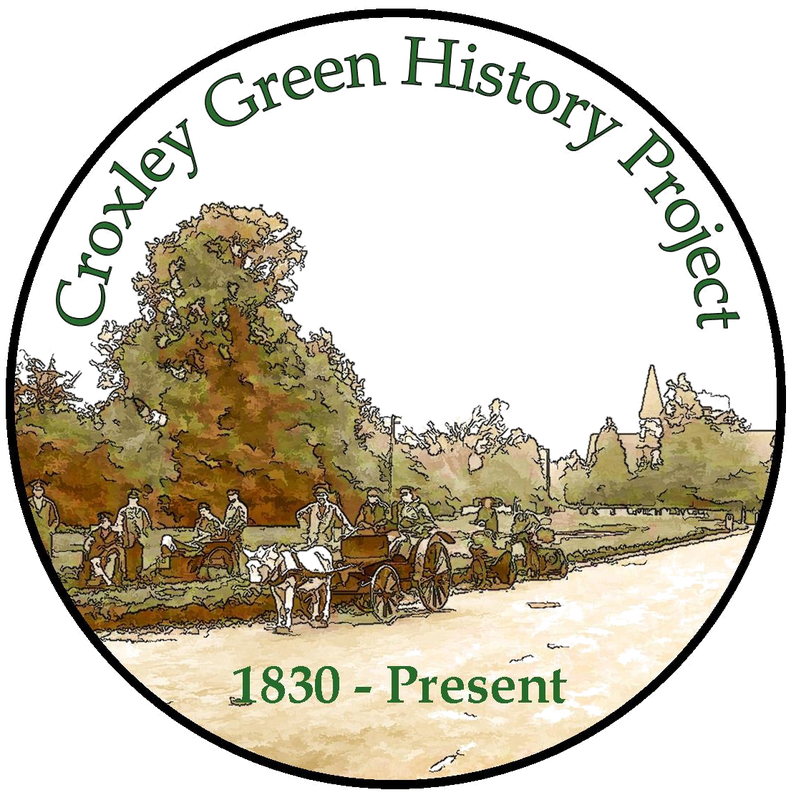 The appeal has been turned down and Croxley Green will therefore not have shops at the junction of Baldwin's Lane and Watford Road. The decision will, without doubt, be regretted by the majority of residents in the vicinity who have at all times made their views so clear. 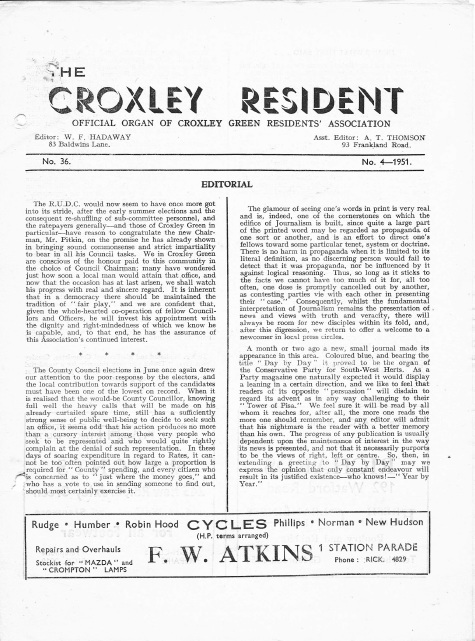 with their house building programme which would appear to make provision for approximately 182 houses of various types for letting: Most of these will be erected on the Berry Lane estate and it is unlikely that there will be much, if any, building in Croxley Green:- It matters little, however, in these days of need, where the building takes place as long as the patient applicant gets his house. save as much waste paper as possible and to keep this away from the refuse bin, by storing it in a sack or carton, etc., for easy collection and to avoid contamination with the normal refuse. Paper thus saved may well mean a saving in rates. ​THE THIN EDGE OF THE WEDGE? 3. The uncomfortable feeling that the present cut is only the' " thin end of the wedge" and that before long similar action will be taken to close the line altogether. People affected fall into various categories. Owing to congestion at certain hours on the Metropolitan line, more and more business men and women are inclined to use the L.M. service if at all possible. Now, if they should be so unfortunate as to arrive at Watford after 7.30 p.m., their season tickets will be useless and they will have to seek alternative means of transport. Late travellers-and they are not few-returning from Watford after the 'bus services have finished for the night, have relied upon the L.M. trains to get them home. This particularly applies to shift workers at local factories and even Railwaymen on late shift will be affected, we can foresee certain Unions being urged to take an interest in this matter. particular-have reason to congratulate the new Chairman, Mr. Pitkin, on the promise he has already shown in bringing sound commonsense and strict impartiality to bear in all his Council tasks. 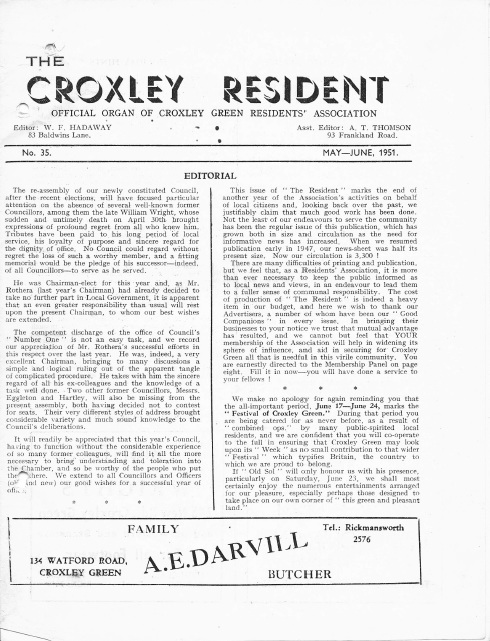 We in Croxley Green are conscious of the honour paid to this community in the choice of Council Chairman; many have wondered just how soon a local man would attain that office, and now that the occasion has at last arisen, we shall watch his progress with real and sincere regard. 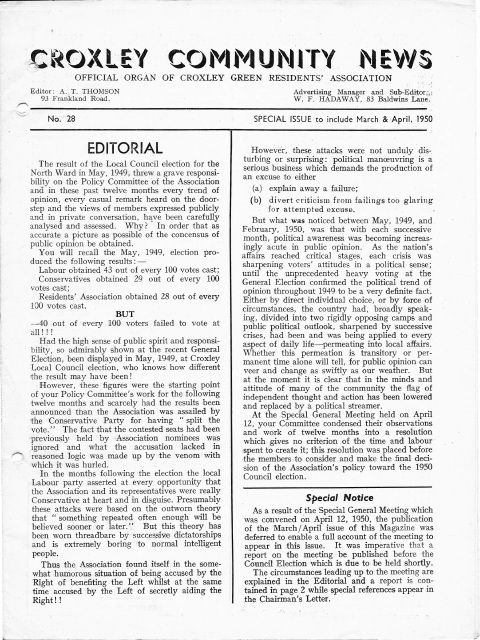 It is inherent that in a democracy there should be maintained the tradition of "fair play," and we are confident that, given the whole-hearted co-operation of fellow Councillors and Officers, he will invest his appointment with the dignity and right-mindedness of which we know he is capable, and, to that end, he has the assurance of this Association's continued interest. A few good photographs of the Festival Tableaux, Events, and Procession are available; please contact Mrs. T. Pooley, 72 Malvern Way, Croxley Green. scheme to Cassiobridge, but no farther. The road must continue, but where? turned into the cutting halfway along the road and its remorseless appetite forsook pavements in favour of a softer diet. Inevitably its progress has left scars; inevitably, too, those scars will take time to heal, for even modern road surgery has its limitations 'and cannot overnight reinstate things to their erstwhile conditions. - The Highways Committee of the Association, having due regard to the circumstances, and appreciating that time must be allowed for subsidence before the 'final remedial measures can be undertaken by the authorities are maintaining a watching brief. house or another's, whether in "rooms" or "digs", tile Association is for YOU! Don't hesitate any more. Get in now, and help make 1952 a real leap year! 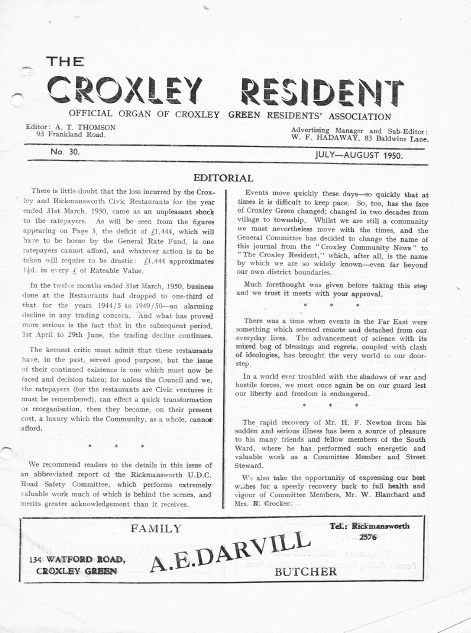 against the extension of the Borough boundary to take in Croxley Green. We will, however, have to "wait and see'.